Only taxable IRA distributions increase your adjusted gross income. All individual retirement arrangements offer tax-sheltered growth, so as long as you're not taking distributions, the earnings don't affect your adjusted gross income. But your withdrawals from the IRA do add to your adjusted gross income if the distribution is taxable. Not all IRA withdrawals count as taxable income -- it depends on the type of IRA, the contributions in the account and, if you're withdrawing from a Roth IRA, whether you're able to take qualified distributions. The taxability of distributions from a traditional IRA doesn't depend on whether you're taking a qualified distribution. Instead, your whole withdrawal counts as taxable income -- and increases your AGI -- unless you've made nondeductible contributions. Nondeductible contributions refer to money that you contributed, but didn't deduct on your income taxes, either because you or your spouse were covered by an employer plan and your modified adjusted gross income exceed the annual limits, or you simply chose to make a nondeductible contribution. If you've made nondeductible contributions, calculate the percentage of your traditional IRA made up of this type of contribution. That's the percentage of your withdrawal that comes out tax-free. For example, say you have $10,000 of nondeductible contributions in a traditional IRA worth $50,000. Because $10,000 divided by $50,000 is 0.2, 20 percent of your withdrawal is tax-free. So if you take out $5,000, $4,000 is taxable and increases your AGI, and $1,000 is tax-free. If you're taking a qualified withdrawal from your Roth IRA, it doesn't affect your AGI because it comes out tax-free. Qualified withdrawals require that at least five years have passed since January 1 of the first year you made a contribution. You also must be either 59 1/2, permanently disabled, taking withdrawals from an inherited Roth IRA or taking out up to $10,000 for a first home purchase. 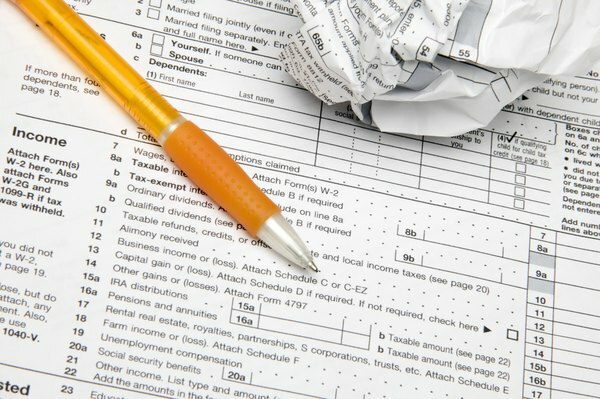 You do have to report your withdrawal on your tax return -- it just doesn't count toward your AGI. If you're taking an early withdrawal from your Roth IRA, your AGI goes up only if you take out earnings, because contributions come out tax-free. For example, say your Roth IRA contains $19,000 of contributions and $11,000 of earnings. Your first $19,000 of distributions comes out tax-free. However, if you take out $20,000, your AGI goes up by $1,000, because the last $1,000 of the distribution comes from earnings, which increases your taxable income. You can use either Form 1040 or Form 1040A to report your IRA withdrawals. If the IRA withdrawal is fully taxable, simply report the amount on line 15b of Form 1040 or line 11b of Form 1040A; that amount adds to your AGI. If all or a portion of the money is tax-free, report the total distribution on line 15a of Form 1040 or line 11a of Form 1040A. Then, report the taxable portion (or $0 if it's all tax-free) on line 15b of Form 1040 or 11b of Form 1040A. Only the amount on line 15b or 11b gets included in your AGI. If you're taking an early withdrawal, you must pay a 10-percent penalty on the taxable portion of the withdrawal. For example, if you take out $8,000 and $6,000 is taxable, you owe a $600 penalty. However, owing or not owing an early withdrawal penalty doesn't affect your adjusted gross income. The penalty is calculated on a separate form -- Form 5329 -- but ultimately gets reported on line 58 of Form 1040.